October is here, bringing with it misty mornings, nippy nights and a craving for food which warms and comforts. I’m a big fan of soup and I find myself making a pot of it every few days at this time of year, with whatever goodies we’re currently pulling up from the veg plot. Ade had great success with his root vegetables over the summer and after I came across a half-forgotten bag of carrots, parsnips and beetroot that we’d harvested a while ago (thank heavens root veg keep so well! ), I decided to roast them with our home-grown garlic and thyme before blitzing them into a soup. Roasting only improves the flavour of root vegetables, enhancing their earthy sweetness, so it’s well worth throwing them into a tray with some oil and herbs before simmering them in stock, it really makes a world of difference to the taste. 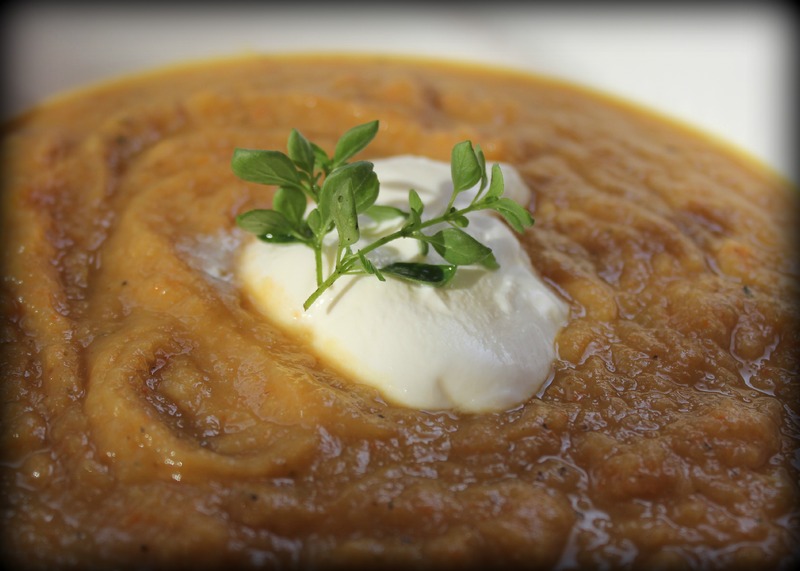 The result is a rich and robust soup, perfect for a chilly autumn day. Take a small piece of aluminium foil and place the garlic bulb in the centre. Pour over 1/2 tbsp. of the olive oil and season with salt and pepper, before wrapping it up in the foil to protect it. 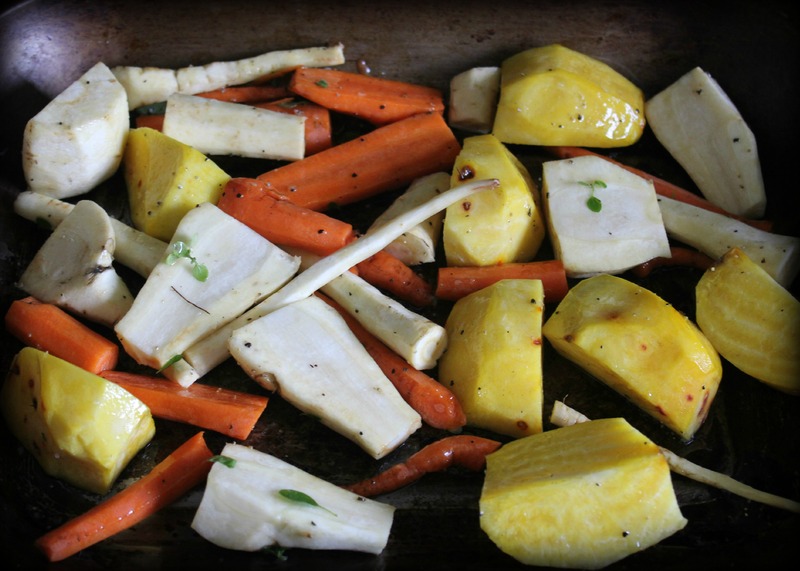 Peel and chop the root veg into large chunks and place in a roasting tray. Toss the veg in approx. 2 tbsp. of olive oil, salt, pepper and half of the thyme leaves. Spread out in a single layer, adding the foil-wrapped garlic to the tray. Cook for 1 hour. When the veggies are nearly cooked, heat 1 tbsp. olive oil in a large saucepan. Add the chopped onion and cook over a medium heat, stirring occasionally, for 5 minutes. Remove the veg tray from the oven and put the garlic bulb to one side, unwrapping the foil and allowing it to cool. Add the root veg to the pan (along with all the sticky, caramelised goodness from the roasting tray), give everything a good stir and add the stock. Simmer for 10 minutes before turning off the heat. When the garlic is cool enough to handle, separate the cloves and squeeze out the soft pulp inside onto a chopping board. Stir the garlic pulp and the remaining thyme leaves into the soup. 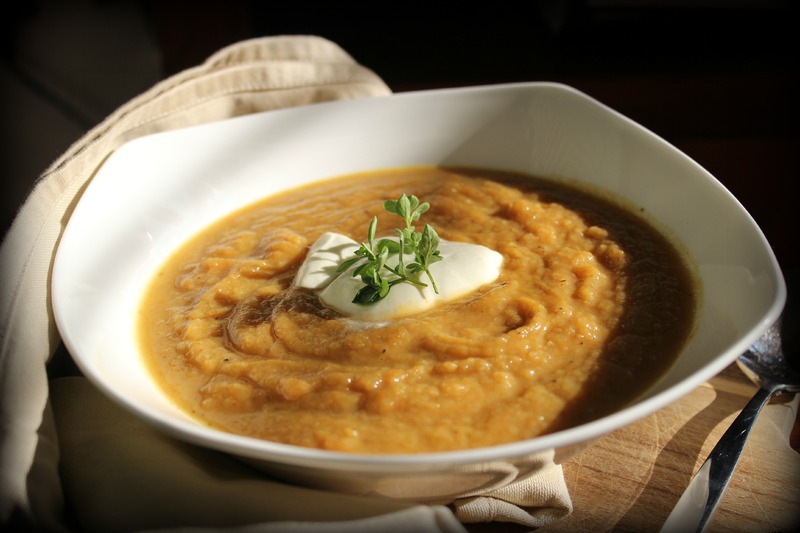 Transfer to a blender to puree the soup, and return to the pan to re-heat gently. Ladle into warmed bowls with a dollop of crème fraiche and a garnish of fresh thyme sprigs. Good recipe, going to give it a go in a couple of weeks when I have to make soup for an event. I agree about roasting. I did just that with carrots, sadly not my own, but at least the coriander was!